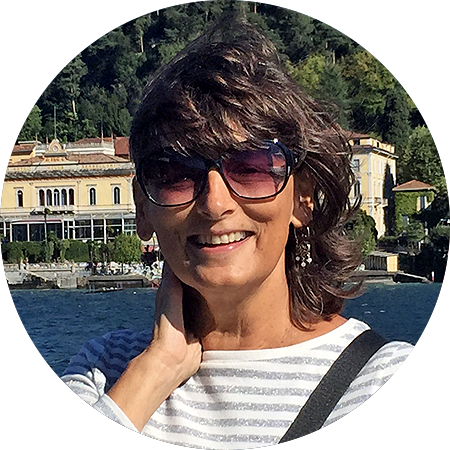 To my readers: I’m ceding the Ciao Chow Linda reins this week to my son Michael, a journalist who also knows his way around the kitchen. 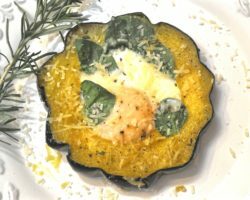 He’s made this dish several times in the past few years, and with the Super Bowl fast approaching, he agreed to write about it for my readers. It’s an ambitious project no doubt, but gather some friends and work on it together, then sit back and watch the big game on Sunday. My friend Garrett and I first heard about the timpano when watching the film Big Night, starring Stanley Tucci and Tony Shalhoub as two brothers who own a restaurant in the 1950s in New Jersey. 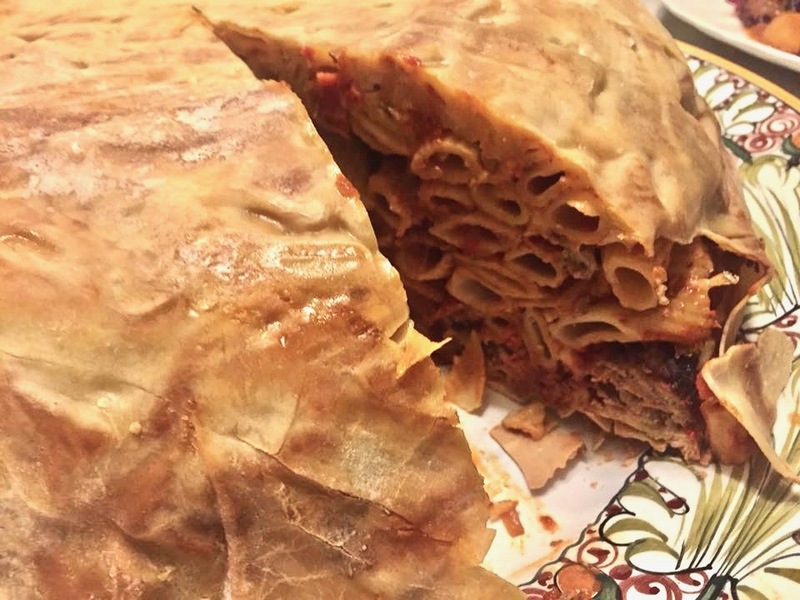 The “big night” in question is a magnificent dinner prepared in anticipation of Louis Prima, the main course of which is the timpano. 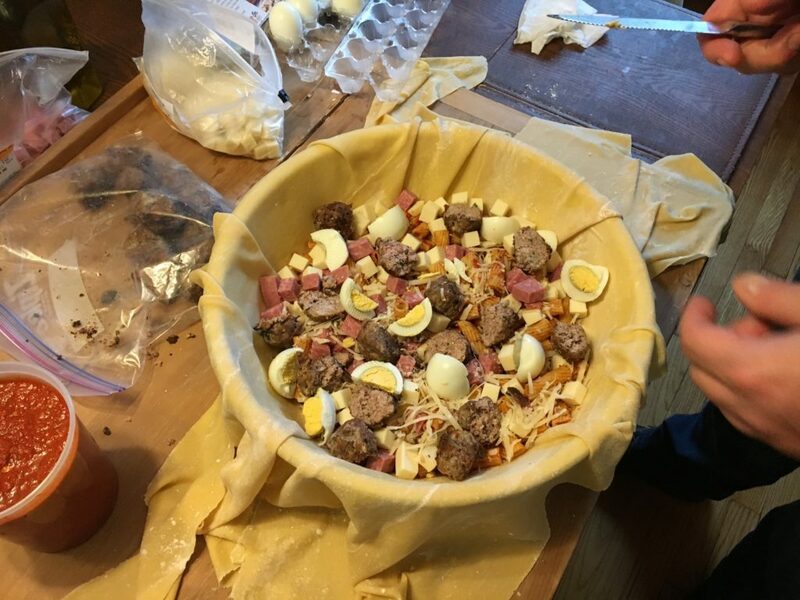 We watched with amazement as the two brothers unveiled this showstopper of a dish, a large “drum” of pasta filled with ziti, meatballs, provolone, mozzarella, hardboiled eggs, salami, and tomato sauce. It’s not a dish for the faint of heart. Literally. After seeing it on screen, we knew we had to recreate it in person. Garrett found the recipe in Stanley Tucci’s cookbook, which we then adapted a bit. You can add in meats and cheeses as you see fit. 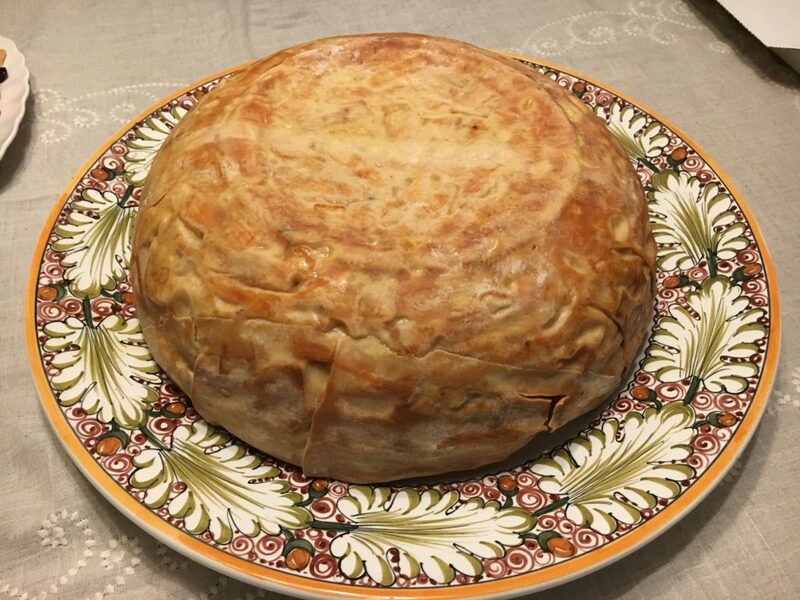 The timpano is baked inside a large ceramic or metal pot; when it’s time to serve, you flip the pot over so that the timpano slides out, much like an upside-down cake. When it works, it’s impressive. When it doesn’t, it’s disastrous. If any sticks to the pot, the whole thing will disintegrate, leaving you with a delicious mess. Another word of warning: A full-size timpano is enough to feed an army. We made one for the Super Bowl, and even with 20 people over (and helping themselves to seconds), we still had half of it left by the time the Eagles beat the Patriots last year. 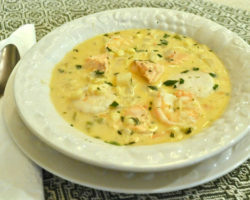 This recipe calls for a bowl that’s about 6-8 inches deep and about 12 – 14 inches in diameter. Obviously, if you use a smaller or a larger bowl, the amount of stuff you’ll need to fill it will change. You could conceivably use a casserole dish, too. 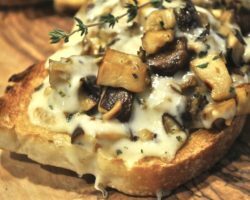 While this recipe isn’t overly complicated, it involves a number of steps, so it will take some time. 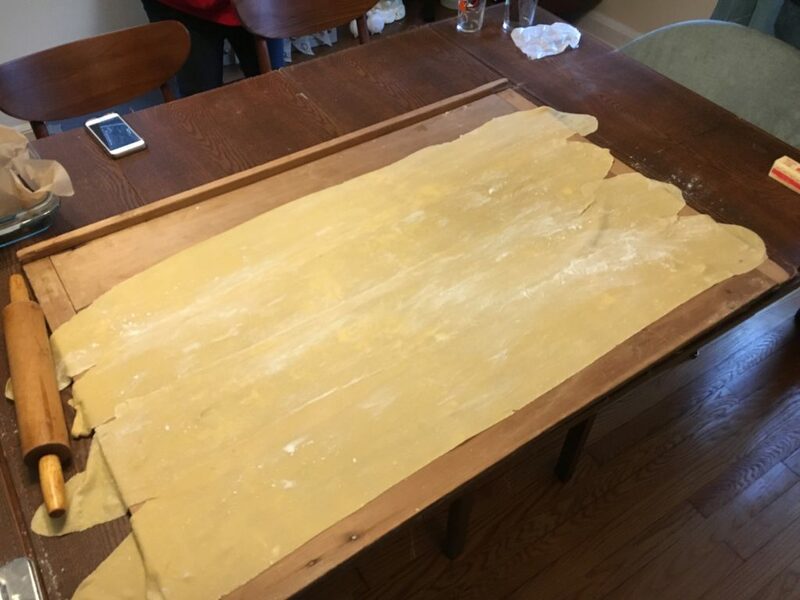 You’ll need a large table or pasta board for rolling out the dough. This pasta board belonged to my paternal grandmother, and is probably at least 75 years old. 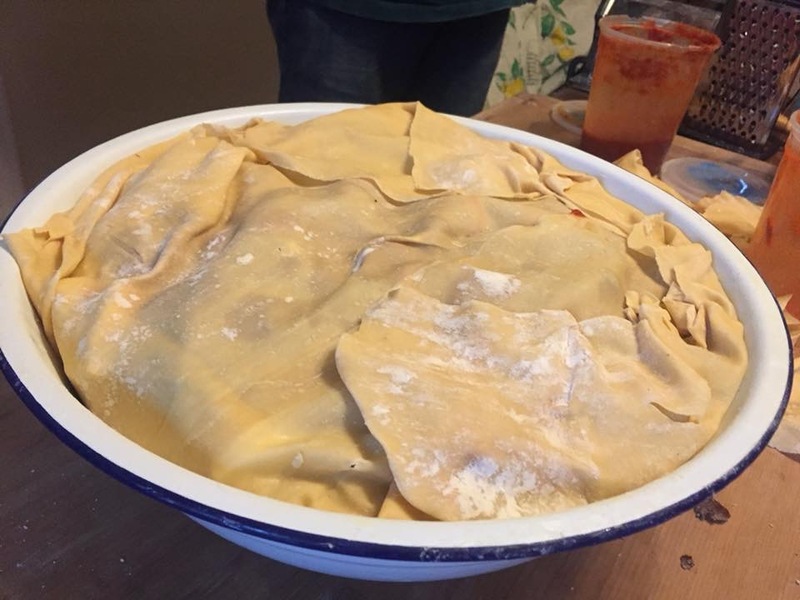 The wide strips of dough are pinched together to make one large piece of dough that becomes the outer shell of the timpano. 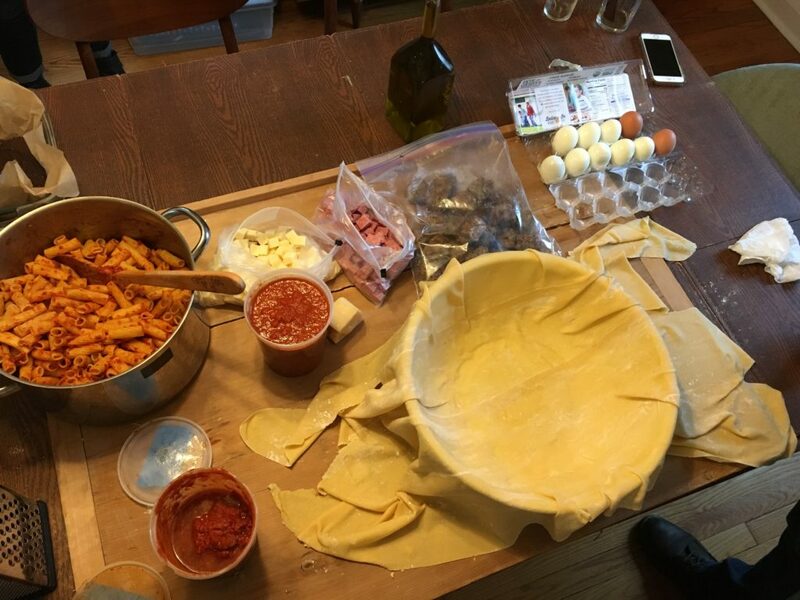 Be sure to have all the ingredients ready to go before you start assembling the timpano. The ziti is tossed with tomato sauce and placed into the dough-lined bowl. Be sure to undercook the ziti, since it will bake more in the oven. 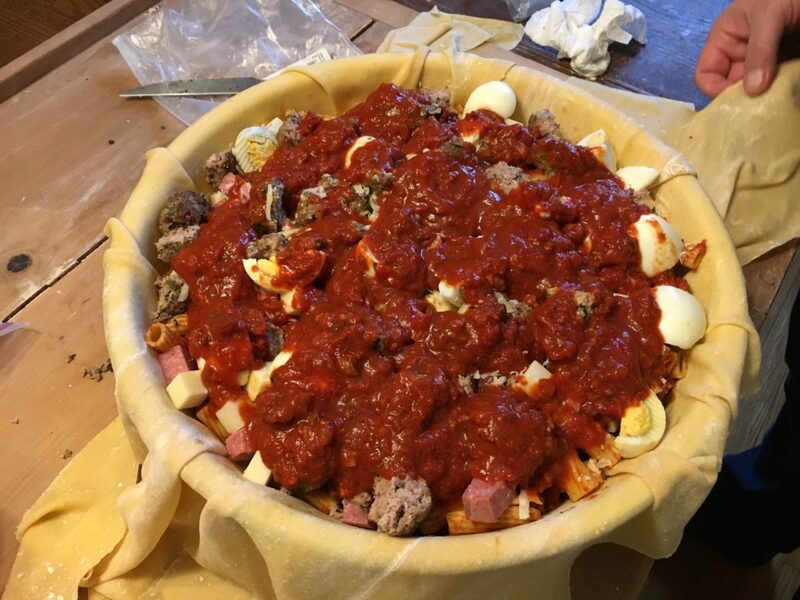 Top with half of the eggs, meatballs, mozzarella, salami and provolone. Add sauce on top, then more pasta and repeat with the other ingredients, finishing up with sauce. Pour the beaten eggs over everything. 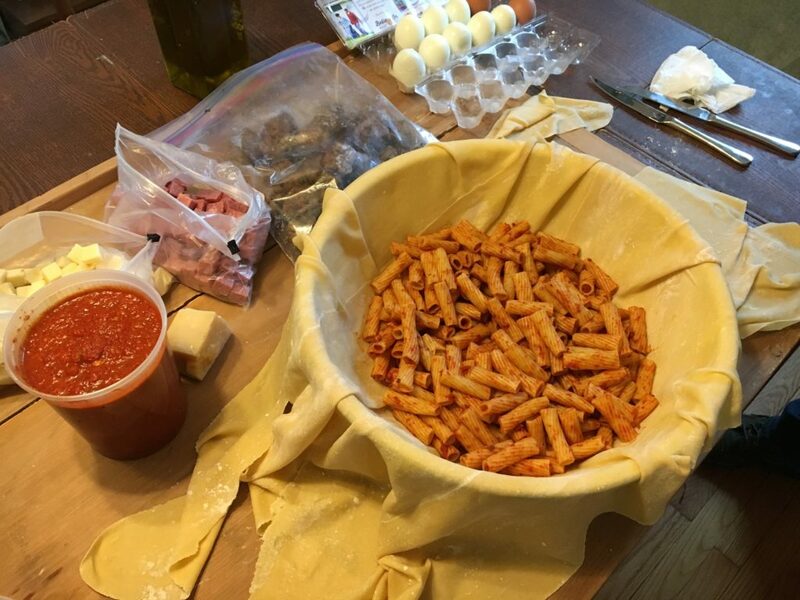 Cover the bowl with the pasta that’s hanging off the side, making sure the timpano is completely sealed. Trim the excess dough and place in the oven, following the directions below. 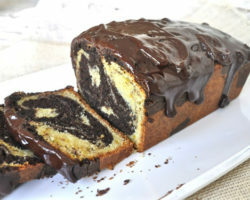 After letting it rest for 30 minutes, flip it out of the bowl and you’re ready for the reward. All you need is a good glass of wine and a salad and you have enough to feed an entire football team. A huge pasta and meat filled extravaganza fit for a crowd. 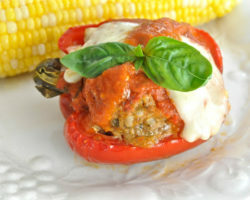 Make about two dozen meatballs; they should each be the size of a grape tomato. Have the tomato sauce ready. It should be room temperature. It should be on the harder side of al dente, as it will cook more in the oven. Thoroughly grease the inside of the bowl you plan to use for the timpano. While the ziti is cooking, roll out the pasta dough to the thinnest possible setting. Take the strips and lay them next to each other lengthwise so that their edges are touching, and seal them together to make one large sheet. You’ll want it to be big enough so that it not only completely lines the bowl, but that there’s enough overhang to completely cover the middle of the bowl. Carefully take the sheet of pasta and line the bowl. There should be a lot of overhang. Toss the drained pasta with two cups of sauce. Pour about 6-7 cups of pasta into the bottom of the timpano. 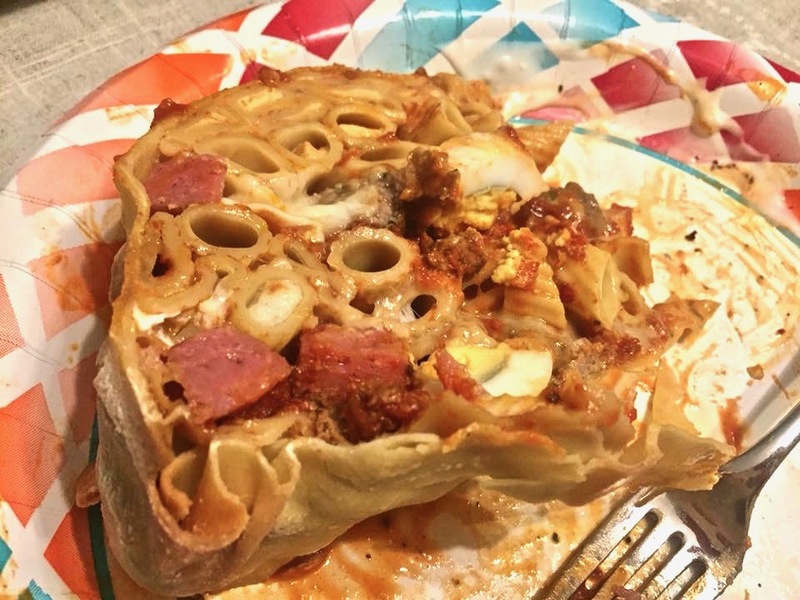 Top with half of the salami, provolone, eggs, meatballs, and cheese. Pour another two cups of sauce on top. Pour in another 6 cups of the pasta. Add the rest of the salami, cheese, meatballs, and eggs. Top all that with the remaining sauce and pasta, so that it comes to nearly the top of the bowl. Pour the beaten eggs into the bowl, making sure to distribute them evenly. Fold over the dough and seal it completely. Trim away any excess dough. Bake for about 1 hour until the top is lightly browned. Cover with aluminum foil and bake another 30 minutes or so until the internal temperature is 120 degrees. Remove from the oven and let rest 30 minutes. 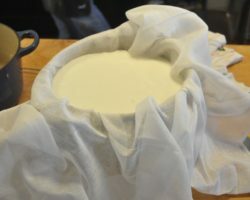 At this point, the timpano should be able to move freely; try shaking the bowl clockwise and counterclockwise gently to see if it moves. Now the fun part: Get a large pan or dish (one that covers the entire diameter of the bowl), and place it on top of the bowl. Holding the two tightly together, flip the bowl upside down. Carefully lift the bowl. The timpano should come out cleanly. Let the timpano rest for another 30 minutes, then use a long thin knife to slice it like a cake.